Today, on Facebook, a Wal-Mart ad showed up for their new e-book catalog. 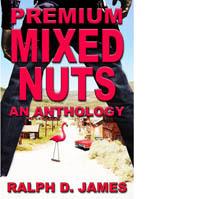 Just for exercise, I searched their page for Premium Mixed Nuts’ ISBN, and, Voila! There it was. So, if you’re cruisin’ at Wal-Mart and you’re looking for something to read, I’ve got just the thing. Here’s where they’ve got it. This entry was posted in Book and tagged My Book. Bookmark the permalink.